Prevent break-out burrs and flaking common to material with adhesive facing on the backside, and get finely-cut surfaces without noticeable knife marks. 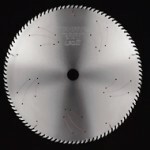 These tough, wear-resistant blades can cut all types of wood material from normal lumber and birch to MDF boards and other material. The teeth use ultrafine particles and special ultra-hard alloy tips. The unique laser-cut noise-reducing slot and newly-developed special resin plugs improved vibration control even more. The cutting noise is reduced and a high quality cutting surface is achieved. By improving the base metal surface roughness and using a special surface treatment, this saw blade reduces the chips and debris that stick to the blade and reduces cutting resistance.